This is a smoke-free area. This is what the pupils of Integrated Laboratory School (ILS) Elementary Department of Western Mindanao State University (WMSU) wants to convey…and yes, they literally wear the message in the midst. 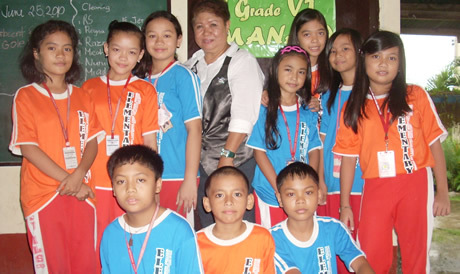 On a regular Friday, the pupils of ILS – Elementary Department wear their Physical Education (PE) shirts that bear the design of a smoke-free campaign. It was recalled that the move for a smoke-free environment was first undertaken by the university through the leadership of Dr. Grace J. Rebollos and through the staunch team of RDEC composed of Dr. Sarmiento, Prof. Rosalyn R. Echem, Ms. Ere Lee Q. Salang, research assistant and Engr. Oscar S. Sicat, university statistician. This advocacy was in consonance with RA 9211, otherwise known as the Tobacco Regulation Act of 2003, which bans smoking in public places, prohibits sale of cigarettes within a 100-meter radius of school campuses and prohibits smoking among youths aged 17 years and below. Since the idea sprung in 2008, the university is not only settling for “smoking areas” in the campus but envisions to have a totally smoke-free campus. This has been well-taken by a number of advocates in the campus to include the university officials, faculty members and student leaders. In a separate interview with the ILS Principal, Prof. Yolanda N. Natividad, she believes that this is a good initiative undertaken by the university as we are locally taking the lead in the campaign for a smoke-free environment.